Gate Episode 16, The Dragon, Once More, shows what happens when Yōji Itami and Tuka Luna Marceau face off with a huge fire breathing dragon. You can buy Vol 1. of Gate anime (appears to be season 1) from Amazon here. Note: As usual, my review contains spoilers. Delilah is so happy that she’s singing in the streets. So, of course, we know something terrible’s going to happen to her. Capture from the Crunchyroll stream. Delilah is walking through the streets of Alnus singing about how wonderful it is to be there. So as a viewer, you know immediately something terrible’s going to happen to her. When she gets back to her room, we find out what. A scroll with an Italica seal is waiting for her. It orders her to kill one of the Japanese. We know from last week who: Noriko Mochizuki. Tyuule is in her cell lamenting that as the proud queen of the warrior bunnies, she hates trusting her fate to her enemy (the empire). Bouro visits to tell her her message had been delivered. Tyuule revels in the knowledge that her spy in Alnus is about to kill Mochizuki. The queen’s particularly happy that she’s tricking Delilah into the murder, because Delilah has sworn to kill Tyuule. Tyuule’s goals remains: crush Zorzal El Caesar, the one who destroyed her people, and his empire along with him. As Delilah prays in preparation for battle, she asks for help taking revenge on Tyuule, who Delilah says betrayed her and her people. Akira Yanagida is busily getting the signatures he needs to legitimize Itami’s quest. He’s shocked when he finds the Lieutenant General and his staff waiting for him. Yanagida tries to stick to his theme of justifying Itami’s trip as a reconnaissance for natural resources, but the General is looking for an excuse to help Itami fight the dragon. He seizes on the idea that since Itami is an idiot about to fight a dragon, they can’t let a fellow Japanese citizen, even an idiot, die needlessly. There’s only one problem left: how to handle the diplomatic side. The General sends Yanagida to talk to Duran, who was the man who gave Itami fatherly advice in the last episode. He’s also the king of Elbe, which is the kingdom to which Itami is traveling. Yanagida forges a pact with Duran, and Duran gives permission for the Japanese Self Defense Force (JSDF) to enter his province. The General then orders arial reconnaissance of the area before he sends ground troops. Mochizuki tries to call home but gets a message that the service had been discontinued. She had learned from the JSDF that her family hadn’t been seen after the Ginza Incident. She’s crushed and muses out loud that it might be better if she died. Delilah arrives and confesses she’s relieved. She hadn’t wanted to kill someone who wanted to be alive. Their conversation was almost cordial until Mochizuki said that Delilah sounded like Tyuule. Instead of trying to escape, Delilah tries to kill Yanagida. Capture from the Crunchyroll stream. That’s whenYanagida arrives with pistol drawn. Delilah is so fast he can’t hit her until she inexplicably decides to stab him. That’s when he emptied his clip into her. Both of them survive surgery. 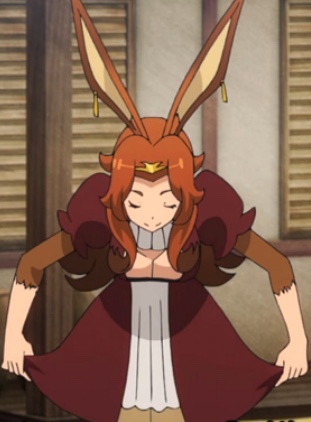 Alnus is in an uproar. Many of the natives are afraid they’ll be cast out, afraid that the JSDF will lump them all together with Delilah. They are relieved when they find that’s not the case. The MPs discover the letter ordering Delilah to kill, and they trace it to Italica. Kaine is furious that the butler, Bartholomew, had provided the seal and paper used to delude Delilah. The JSDF suspects Zorzal is behind the effort, since he stood to gain the most. They sow false information to see where it leaks and leverage Recon 3, stationed in the capital, to gather more intelligence. On the third day of their patrol, the JSDF’s Phantom jets are searching for the “Class-1 Special Region Harmful Animal.” Their goal is to see how it can maneuver. They find the dragon, and it dutifully shows them its moves — it is almost as fast as a jet, can turn more quickly, and can hover like a helicopter. And it almost incinerates one of the planes. Itami, Yao Ro Dushi, Rory Mercury, Tuka, and Lelei La Lalena arrive at Rorudom Canyon where Yao’s people live. The rest of the team wait for Yao to announce they’ve arrived. As Yao reaches the bottom of the canyon, the dragon lands almost right beside Itami and the others. Tuka’s frozen in fear. Rory attacks it with her pike/axe and forces it back into the air. Lelei tries to hit it with her magic, but it’s too maneuverable. As Rory keeps it occupied, Itami forces Tuka to confront the reality that the dragon killed her father, and that she can take revenge by killing it. He helps her aim the rocket-propelled grenade (RPG) and fire. The dragon leaps out of the way and flies off — for now. Tuka’s left in tears, the RPG tube still in her grasp. Tuka’s revenge and, I hope, her healing, will have to wait. Capture from the Crunchyroll stream. Delilah looked so happy at the beginning of the episode! I wish I could have enjoyed it without the heavy shadow that Tyuule cast in the last episode. It was fun to see Yanagida taken aback, even if momentarily. He’s also so much in control of the situation that I couldn’t get a read on his personality. Now I get the idea he’s a decent soldier who’s learning to manipulate the system to get things done — typically, it seems, to get the right things done. The JSDF couldn’t just call the dragon a dragon. They had to call it a “Class-1 Special Region Harmful Animal.” How military is that? The General’s order to his men made me laugh out loud: “Don’t let that idiot die!” The General and his team had been looking for an excuse to help, and Yanagida handed it to them. Itami’s reputation as an idiot came in handy! When Yanagida’s negotiating with Duran, the king’s surprised that there are resources in his kingdom other than gold and bronze. Yanagida tries to get rights to all of the resources other than bronze and gold, which the king won’t give up. The king counters with “rights to anything that isn’t used in currency.” I wonder if that’ll come back to bite the JSDF? I liked seeing Duran negotiate with the technologically superior JSDF and show that intellectually and politically, they’re on even footing. After his meeting with Duran, Yanagida laments that not only are Duran and the General helping Itami, but now Yanagida himself is, too! He seems more bewildered than vengeful. At least, that how I’m optimistically reading the reaction. I hope he doesn’t turn on Itami. There are enough plots in this series already! 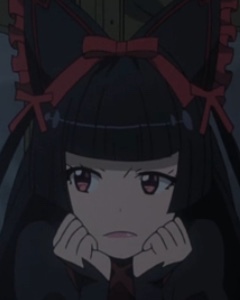 We learn that not only does Rory Mercury hate being underground, she hates rain, too. Turns out Rory Mercury is not fond of rain. Capture from the Crunchyroll stream. Delilah showed she was conflicted about killing Mochizuki. She even hesitated when Mochizuki said she didn’t want it to hurt. I wish the story had done more with this dramatic conflict. I liked Delilah a lot, and I worry that I might not get to see much more of her after this. I’m glad Mochizuki survived, though. The JSDF used finger prints to prove Bartholomew had leaked the paper and seal. His reaction when he realized he couldn’t lie to them was satisfying. I was happy to seem him caught. It’s his fault Delilah got shot and Yanagida stabbed. The dragon’s not only unafraid of the jets, it eagerly engages them. Had the jets not escaped, I think it’s likely the dragon would have destroyed them. From the perspective of dramatic tension alone, I like how there’re beings like dragons in the Special Region against which the JSDF still have to struggle. The JSDF isn’t divine; they’re simply more technologically advanced. Rory doesn’t hesitate: she attacks the dragon. Even when it grabs her and hurls her to the ground, she doesn’t back down. 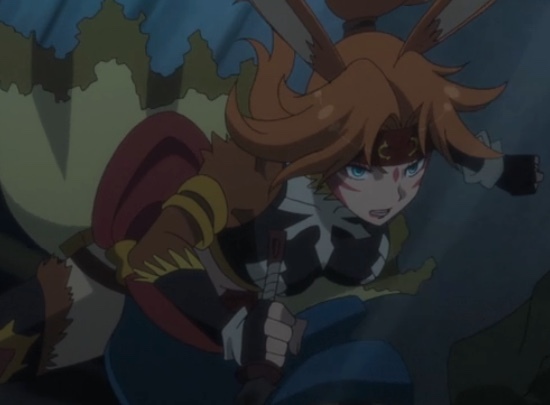 She remains my favorite character in the series. Itami could have fired the RPG at the dragon himself, but he instead decided to help Tuka confront her father’s death and help her kill it. The dragon escaped, at least for now, but he seems committed to helping her through her struggle. I don’t understand why Delilah had to attack Yanagida. Her mission had already been compromised. Why didn’t she flee? There was a chance no one except Mochizuki would recognize her. I didn’t understand her decision to attack. The second season’s third episode continued the new trend of wall to wall action and intrigue. Tyuule’s plan to turn the JSDF against Princess Pina Co Lada fails, but there are still casualties: both Yanagida and Delilah end up in the hospital. Itami, Tuka, and the rest engage the dragon, and it shows just how smart and powerful it is. They are not going to have an easy time killing it. I almost miss the days when Rory gets to smack down clueless Minsters of Parliament and Itami feeds his ex-wife junk food. The stakes are much higher this season, but looking back, I see how almost the whole first season set up the conditions for this powerful drama. Now I’m wondering if Itami can save Yao’s people. Rory did her best, but against an airborne foe, she’s at a disadvantage. Lelei’s magic and Itami’s RPGs are having a hard time keeping up with the dragon’s speed. It’s hard, again, to wait for the next episode!